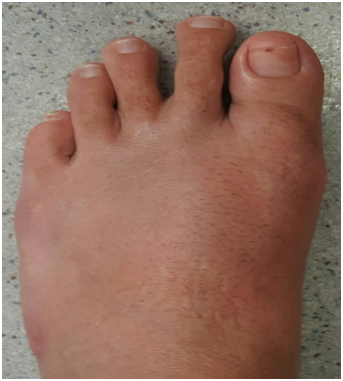 Lapidus bunionectomy and Akin osteotomy were performed concurrently to treat a healthy 44-year-old female patient diagnosed with painful, severe bunion deformity of the left foot. After the surgery, patient was required two weeks of non-weight-bearing on the surgical site, which was followed by four weeks of partial weight-bearing via a tall cam walker boot. X-rays of the Intermetatarsal (IM) angle on the affected foot from preoperative and postoperative appointments confirmed the significant improvement as a result of the intervention. Hallux valgus (HV), commonly known as bunion, is a deformity identified by the lateral deviation of the hallux and the medial deviation of the first metatarsal. According to a systematic review on the prevalence of hallux valgus based on “78 papers reporting results of 76 surveys (total 496,957 participants), prevalence estimates for HV were 23% in adults aged 18-65 years (CI: 16.3 to 29.6) and 35.7% in elderly people aged over 65 years (CI: 29.5 to 42.0). Prevalence increased with age and was higher in females [30% (CI: 22 to 38)] compared to males [13% (CI: 9 to 17)]” . The American Podiatric Medical Association (APMA) states that “bunions form when the normal balance of forces that is exerted on the joints and tendons of the foot becomes disrupted. They are a symptom of faulty foot development and are usually caused by [the way we walk, our inherited foot type, our shoes, foot injuries, neuromuscular disorders, or congenital deformities]” . After successful Lapidus bunionectomy and Akin osteotomy are performed, deformity and pain from HV can be reversed. A 44-year-old female has a long-standing complaint about painful, severe bunion deformity of bilateral feet. Her left foot hurts more than her right foot. She has avoided surgical correction due to prior consultations that recommended prolonged non-weight-bearing and use of crutches. IM angle of 19.54 degrees was revealed on the preoperative X-ray of the left foot. Lapidus bunionectomy and Akin osteotomy were subsequently scheduled. The procedures discussed would allow patient to start protected weight-bearing at two weeks after the surgery. Patient was placed on operating table in supine position. General anesthesia was administered in ankle block type fashion; patient was given preoperative injection of 20cc of a 1:1 mixture of 1% lidocaine plain and 0.5% bupivacaine plain. Next, a pneumatic thigh tourniquet was positioned on patient’s left thigh. Both left foot and leg were scrubbed, prepped, and draped aseptically. An Esmarch bandage was used to exsanguinate patient’s left foot and leg. The pneumatic thigh tourniquet was then inflated to 300 mmHg. The incision was ready to be made at the location of the bunion from the dorsal medial aspect of the left foot with a #15 blade. The depth of incision for the first metatarsophalangeal joint was ensured to be at the level of periosteal and capsular structures and was reflected both medially and laterally. A sagittal bone saw was employed for resection on the medial metatarsal. A burr was used to smooth out the roughened areas of bone. Following copious irrigation, attention was then directed proximally to the base of the first metatarsal as well as the medial cuneiform. The distal cartilage surface of the medial cuneiform and the base of the first metatarsal were resected using a sagittal saw; micro-fracturing and drilling were made with a 0.045 K-wire. Finally, the joint was prepared for the Lapidus fixation and fusion of the first metatarsal and the medial cuneiform. A 4.0 mm x 38 mm Tiger cannulated lag screw was used for permanent fixation. A sizeable decrease in the IM angle was visualized under fluoroscopy. The Lapidus plate, VLC Gridlock plate neutral from Trilliant, was positioned properly and fixated with one 3.0 mm x 20 mm non-locking screw, two 3.0 mm x 14 mm locking screws, two 3.0 mm x 16 mm locking screws, and one 3.0 mm x 18 mm locking screw. 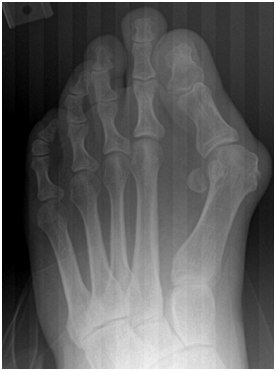 Attention was directed to the hallux to perform the Akin osteotomy at the proximal phalanx. A small wedge was resected from the medial aspect with the base medially and the apex. The Akin osteotomy was fixated using a standard compression staple. After the surgery, patient was non-weight-bearing on the left foot with the assistance of crutches. A tall cam walker boot was used as a method of protection. Radiographs were taken at 2 - 3 week follow-up intervals. Two weeks after the procedure, she began protected walking in the cam walker boot. Patient progressed to full walking with boot only at about five weeks. At approximately seven weeks, she transitioned from boot to regular shoes. Patient achieved complete recovery and fusion of 1st metatarsalcuneiform. The radiographic measurement of the postoperative IM angle is 8.0 degrees, in contrast to 19.54 degrees measured at preoperative consultation. She has also scheduled to have bunionectomy performed on her right foot. Of importance to note, patient started physical therapy approximately one week after surgery. It is necessary to begin early range of motion of the 1st metatarsophalangeal joint to prevent adhesions and a reduction in range. 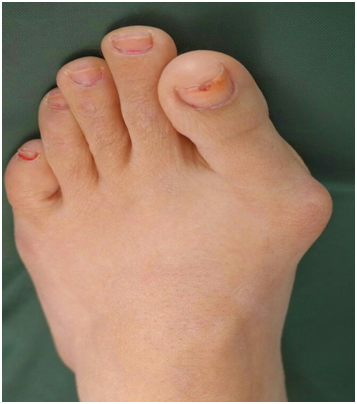 There are several advantages of utilizing Lapidus bunionectomy for severe bunion cases. One notable benefit is the excellent prognosis. According to a recent study of 88 cases, nonunion at Lapidus fusion site only occurred in 2 patients (2.27%) in which successful revision was made within 9 months postoperatively . Another feature is that correction is made at the apex of the deformity and “restores the foot to a more ‘normal’ anatomic alignment” . The addition of internal plating technology in a Lapidus bunionectomy allows for a quicker return to walking. The cumbersome old method of 4-6 weeks non-weight-bearing in a cast will increase chance of 1st metatarsophalangeal joint stiffness. The prolonged period of non-weight-bearing is difficult for most patients and increases chances of falling. Akin osteotomy was selected as the adjunct procedure to further enhance patient satisfaction. The benefit of Akin osteotomy is to produce a straighter toe, which is a desirable trait for patients. 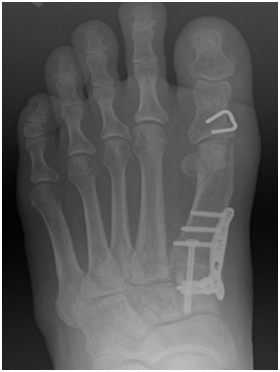 Akin osteotomy allows for better alignment of the hallux and more natural range of motion. Figure 3: X-ray before surgery. Figure 4: X-ray after surgery. Nix S, Smith M, Vicenzino B (2010) Prevalence of hallux valgus in the general population: a systematic review and meta-analysis. J Foot AnkleRes 3: 21. Bunions (2015) APMA: American Podiatric Medical Association. Cottom JM, Vora AM (2013) Fixation of lapidus arthrodesis with a plantar interfragmentary screw and medial locking plate: a report of 88 cases. J Foot Ankle Surg 52(4): 465-469. Neal B (2011) Why The Lapidus Bunionectomy Is The Best Procedure For Severe Bunions. Podiatry Today 24(12).